Owner and operator, Stephanie, leads our team of expert investigators and legal support professionals for impactful and accurate results. Stephanie has over 5 years law enforcement experience and training that brings a higher level of professionalism and quality results to all our work. Stephanie's work for law enforcement agencies, centers C.R.O.W.N. services with a constant reminder to provide truthful results that improve the lives of others. We are proud to offer Iowa with legal support and investigative services that are accurate, honest, and performed with integrity. Our team is here to answer your questions and support your case. We can research into your civil case for a complete review of evidence and relating laws. We offer court document research to find applicable precedents, laws or other important material. By allowing us to research and investigate for your civil case, you can focus on more important matters. We provide a thorough review of criminal charges and corresponding evidence. We assess your case and offer supplemental investigations to bring more information to light. We believe in innocence before proven guilty, and our investigations aim to expose the truth. We offer subtle investigations reasons ranging from infidelity to missing persons. We tailor each case to match your needs. Due to the often sensitive nature of domestic investigations, we conduct investigations with a full transparency and provide an outline of client needs and expectations. To support our investigations, we offer additional services for the best results. Our investigators are capable of going undercover to gather untampered evidence. To further expound on our investigations, we pair the majority of our work with surveillance. By offering surveillance, we bring another level of standard and trustworthiness to help prove your claim. The process of legally serving an individual or party to officially notify them of their involvement in a legal case is just another service we can provide. Our process servers are efficient and accurate when serving paperwork so that your legal case can continue on your scheduled timeline. If you need complete and lawful background checks to verify identity or claims for employment or personal reasons, we can help. All background checks follow a rigorous review to ensure quality and standards. If you need authorization/validation of signatures on legal documents to uphold a contract's legally binding status, we can help. 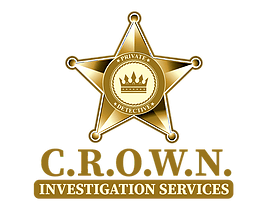 © Copyright C.R.O.W.N Investigation Services. All rights reserved.